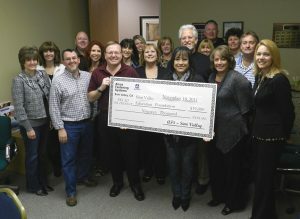 We recently received a $19,000 grant from Alcoa Fastening Systems, located in Simi Valley. This generous donation is a step forward in filling the gap between what public schools can afford and what educators seek to achieve and will further support and enhance the educational process within the Simi Valley public school system. Jim Vigdor, Operations Manager at Alcoa Fastening Systems in Simi Valley, personally delivered the check to the Foundation at a recent Board meeting. “Alcoa is delighted to partner with the Simi Valley Education Foundation again this year. Investing in education and strengthening ties with the community, is an investment in the future of Simi Valley,” he said. Over the past five years Alcoa Fastening Systems has awarded nearly $100,000 in grants to SVEF, which goes towards our Enhancement Grant program that provides needed resources to educators in Simi Valley public schools. Alcoa Fastening Systems produces aerospace components, production tooling, bolts, assembly tool systems and header tooling for the aerospace industry.The grant is part of Alcoa Foundations commitment to improving the quality of life in communities where Alcoa operates. The Simi Valley Education Foundation is proud of the businesses and individuals that support its programs and invites the generous support of the community to help bring the highest quality classroom experience to the students of Simi Valley Schools. The Simi Valley Education Foundation(SVEF) helps to sponsor this two-day program that focuses on high school juniors and seniors challenging them to think about drinking, driving, personal safety, the responsibility of making mature decisions and the impact their decisions have on family, friends and many others. This program is offered at Royal High School and Simi High School on alternate years. .